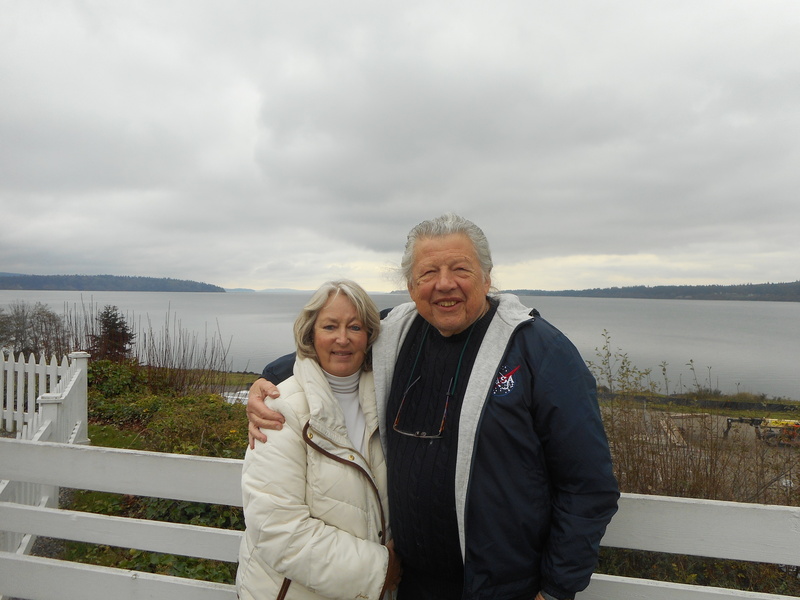 In early November we visited the magical Olympic Peninsular which is a wildly beautiful mountainous region several hours drive from Seattle, Washington. We stopped at the Jamestown S’Klallam Tribal Center and had a long conversation with Wendy Humphries who is the Art Buyer at the Native Art Gallery. She is a S’Klallam Native American, pictured on the left. She shared much of the customs, culture and belief systems of her tribe of which she is an Elder. She showed us many locally made tribal dreamcatchers, totem poles, and a vast array of native art. The energies of the gallery, the artifacts and Wendy herself radiated positivity. She invited us to visit the workshop nearby where totem poles were made to order. It was with difficulty that we tore ourselves away from the gallery and made our way towards the workshop. 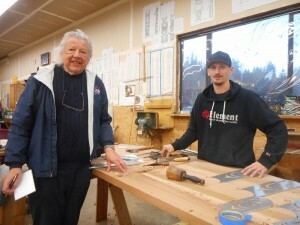 We entered the workshop to be welcomed by Wendy’s son, Dusty who was carving a new totem pole from solid wood. The picture on the left shows Dusty and John together. Dusty too is a member of the S’Klallam Tribe. He is a very keen and eager young man and likes to talk about both his tribe and the totem poles. He shared with us the meanings of the various carvings on the totem poles. As each one was carved and painted to order, it told a different story with specific meanings. The surrounding area was festooned with totem poles of all sizes, some of which were large enough to act as the main support beams on the front of a S’Klallam house. It was a wonderful experience for us to see Native Americans’ being allowed to live within the framework of their belief systems, community, and freedom. It was, for us an inspiring learning experience and they recognised our role as shaman which has created a lasting bond with these people. 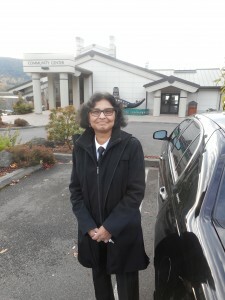 We had the good fortune to be chauffeured that day by Mary, who is pictured on the left. During the six hours we spent in her company, we became friends. We admire greatly her strength in overcoming many harsh obstacles during her life and has now finally found herself. She is a very giving and gentle person that others had taken advantage of to her detriment. She had found the strength to say “NO” and mean it, and to change her life to be who she wanted to be. She has a very beautiful soul and will achieve anything she wants to. The Olympic Peninsular is a vast area that would take many days to explore and we would heartily recommend that anyone who loves nature and rugged scenery goes to visit this beautiful area. See you soon and love to all. I do not write on any other sites but you can follow me on both twitter and facebook under the name of John Norseman. I look forward to your questions. 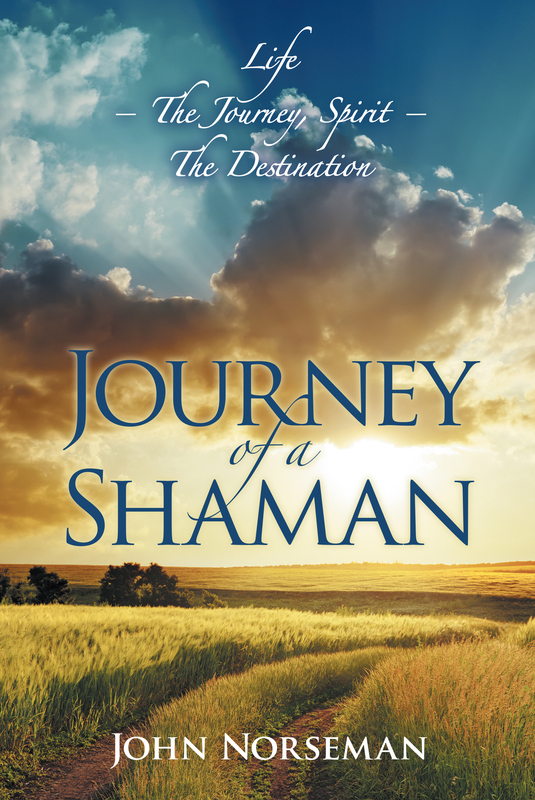 Should you wish to write to me privately my email address is johnnorseman@journeyofashaman.com.